The Medieval II Gold is our pick for the best Total War game, which has good artificial intelligence systems so that it will definitely look more realistic and like a real battle. It is a turn based battle title that lets you control your country, economy and your army to battle it out for supremacy. Our step-up pick is the Hannibal at Gates and the setting of the title is at the 2nd Punic War all the way in the Western Mediterranean. Like the title says, it is about the era of Hannibal as well as with the association of Rome and Carthage in the battle. It can help you experience history in the making. The budget pick is the Beasts of War and this one has a lot of battlefield units and is a supplementary title to the Rome II series. It can also allow you to gain recruitment for Beehive Onager with various capitals like Sparta and Athens. These beasts can all be great tools of the trade in battles. A series of strategy games, Total War is a turn-based game that was originally made in the year 2000 by Creative Assembly, later maintained by Electronic Arts, Activision and Sega. It is a nice series that can be concluded as an influential series for many turn based titles out there on various platforms, which is both entertaining and also educational. It can be a great tutor for your history class as well as for getting insights on what really happens in a war. The combat strategy entertainment series has a total of 17 titles in its series. These titles all have distinct features and settings that can all make you learn more about history. For instance, the one about the Shogun era can teach you more about the history of Japan, whereas the one that is about the wars of Rome can also help you learn more about Rome and its history. There are countless opportunities for you to learn about history here. It is made for various PC platforms, such as Windows, Mac OS and Linux. While it was originally made for the Windows platform, the program eventually became available in the other operating systems like Linux and Mac OS due to popular demand. In this way, more and more people can enjoy playing with a historical and educational title or series at hand. While there can be hardware differences, that doesn't mean that contents can be different with the titles. Nearly all the titles in the combat strategy entertainment series are based off real-life events of battles that happened in our history, such as the medieval times, the times of Napoleon, Attila and many more. These are helpful for those who are trying to pass history and also those who want to learn more about what happened during these times of war and combat. It is important for history teachers to know that sometimes, video games can offer some knowledge like this, and not all playing titles can be bad for a child's grades. Strategy combat entertainment series like this should require the player a lot of wits and thinking skills. It can help a person with their strategic thinking, including the placement of soldiers, when to send the backup team, proper placement of snipers and other aspects of the battlefield. This can help them to apply these kinds of aspects in real life so that they can be more creative and organized in their management in any kind of chosen field. This kind of combat strategy entertainment series can help those who want to improve their strategic thinking, such as those in the military. In fact, much like other combat games, it can helpful for the military personnel or forces of any country so that the next time they end up in combat, they will have more better strategies to come up with. Platform: consider if the combat strategy entertainment title is made on Windows, Mac or Linux, or even for other consoles. You also have to consider whether the combat strategy entertainment series includes a version for your specific platform or operating system. Windows based titles are the most common types of formats for these titles, since they are the most popular operating system of all. Console versions, such as those for the Xbox can also be found for this kind of combat strategy entertainment series. Name and settings of the title: different combat strategy entertainment series can have different titles and settings. For instance, some of them are set in the Roman period, some are in the Japanese period, some are more modern while some are still in the ancient battles. Learning about these different eras can make it easier for a student to study about history, battles and the like, in an interactive and realistic way. Engine used: some combat strategy entertainment series are used in TW Engine 1, 2 or 3, depending on the title's chronology. The engine can have an effect on the performance of the whole title or series, and this is why it is constantly being upgraded in order to cater to the needs and desires of the players of the combat strategy entertainment series or the aforementioned titles. Expansion packs: there are some combat strategy entertainment series that have more expansion packs than other titles in the series. The expansion pack of the combat strategy entertainment series can help with the lifespan of the title, so that the player will keep on playing it despite the main story or objectives already ending and have been cleared by the player countless of time. More expansion packs lead to better playing opportunities, and may also explain more back story within the title or era. As our top pick, the Medieval II Gold is a great battle title in which you can definitely decide on what to do with your country, economy & army, and you can strategize and make amends for the people who are in your country. It helps you to get history to a whole new level and the battles are quite realistic. The historical details that has been given to this title is also immersive. Even if it is an old game that has not very good with graphics, the strategy is very good and very relevant to today’s gaming industry. Other than that, the title also allows you to play all the historical tactics and will also allow finding the paths of your units within battles, which can pose as a great challenge. It is a greatly addicting title and has been a great title throughout the years. While not a deal breaker, the Medieval II Gold may have some problems in packaging, but this is a minor issue and does not affect the quality of the game. The Hannibal at Gates is our step-up pick, which has much to do with the outbreak of the 2nd Punic War. It is an eye-opener for those who wondered if they could change history during the time of Hannibal, as it gives you the setting of the Western Mediterranean and also involves the likelihood of Rome and Carthage in the battle series. There is also a unique Multiplayer Campaign mode for your friends and family to enjoy. There are also two new battles that you can enjoy, such as the Battle of Cannae and the Battle of Zama. You will also get involved in identities like the Arevaci, the Lusitani, and the city-state of Syracuse. It requires 35 GB of space on your disk and at least 2 GB of RAM and at least dual core or higher. It works with Windows. The Beasts of War is our budget pick, in which you can choose various kinds of beasts that you can get into battle, such as the Molossian Dogs from western Greece, the Beehive Onager, the Scorpion Pot Ballista, the Snake Pot Ballista, the Camel Cataphracts, the Celtic Warhounds, the Mercenary Syrian Armoured Elephants, the Wolf Warriors, the Sobek Cultists and the Mercenary Leopard Warriors. All of them can be recruited by a variety of countries and states. If you are into rampaging beasts other than just tribesmen and soldiers fighting their way into battle then this title is probably for you. It also follows the saga of Rome II so it is a relatable title or series for those who have played it. The title requires 35 GB available space, at least 2 GB RAM and at least 2 GHz Intel Dual Core processor. It will work well on most Windows systems and any DirectX higher than 9.0c of at least 512 MB. 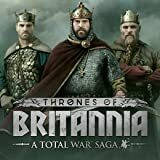 The Thrones of Britannia is the newest installment, in which you can easily pre-order the title before it officially goes out on April 19th, 2018. The story focuses more on England, Scotland, Ireland and Wales as the title indicates and has a ton of campaigns of conquest for you to enjoy. You can expand your territory through as you work your way through the battles and allow the kings to define their legends very well. Along with managing the Anglo-Saxon community, this title also lets you go on Viking expeditions and enjoy many updates to core and key features like recruitment of soldiers, political agenda, new technologies and various conspiracies. With this title, you’re going to change any critical moment in history by making things different with your every decision in the town, kingdom or settlement that you are controlling, in which you can take advantage of the advanced technology and influence. Whether you are a fan of the movie 300 (or even the “This is Sparta” meme) or just a plain Total War nerd, the Wrath of Sparta is a great choice for you, which has a new campaign map and an additional 4 factions you can play in which they have their own faction traits. The tech trees mechanism is also a new feature so that the military forces can have their specific knowledge on one of the 6 branches. You will also come across the Olympic, Pythian, Sithmian and Nemean culture in this title. In this period in Greek history, you can easily change what happened in the textbooks if you strategize carefully and make new decisions that have not been made before. Specialist troops like the Immortal Spearmen, Spartan Hoplites and Skiritai, can also be found in the unit, other than 50 units that you can recruit for land and sea combat or battles. If you are all about dragons and fantasy battles, the Warhammer Limited Edition is a good choice for you. It is a title that has a ton of towering monsters, flying creatures and even your legendary knights and heroes. You can definitely get up close and personal with the unique dragons that can be used for battle and the like. There are also magical aspects of each battle as compared to the realistic titles of the whole series. Because it is a world of fantasy, you can also encounter various races like the Greenskins, Dwarfs, the Vampire Counts and the Empire. You can craft your own unique weapons that can do damage real hard and battle it out in the whole midst of combat in the world of Warhammer. It is a test of magical power and strategies among these brave army men in this unique title. The disk in a metal case so the packaging is good. If you want something that has been set in the Shogun Era back in Japan, the Hattori Clan Pack is for you. It has various modes, such as campaign, multiplayer and custom modes. It has to do with the Oda and Tokugawa clans and the whole title allows you to re-encounter or relive and experience the Battle of Nagashino, which has been written down in history, but with your power to change what happened in the past. In this unique title, if you begin with the General’s avatar at a higher level, you can be able to use it for upgrading to traits or skills for your army and soldiers. Like most TW games, you will need at least Intel Dual Core Processor 2 GHz, 32 GB of disk space and up to 2 GB of RAM. Most of the soldiers in this game will have good guerrilla techniques and martial arts tactics that are battle ready. Yet another title that has been set in the Shogun Era of Japan, the Tsu Faction Pack is a good choice if you already have Shogun 2 or have played it. The title is known also for having multiplayer battles for you and your friends to enjoy. In this title, you will be involved with the provinces of Iga and Ise, various other great clans of Japan and will be placed in the great wars of the Sengoku Jidai. You will also get insights on the history of the Tsu clan and you might also encounter the Choshu and Satsuma domains of Japan. With this title, you will need at least 2 GB of memory (RAM), at least Intel Dual Core Processor 2 GHz, at least 32 GB and any Windows version. Most people enjoy this title because it gives you the ability to play as an another faction in the battles in Japan. The Alexander Rome Expansion is a great title that focuses on Rome battles as well, and focuses more on Alexander the Great and his achievements. Take note that this title is a UK edition, but it will work on most Windows versions, such as Vista, Windows XP, 98, 2000, Windows Me and the like. For those that wanted more from the original title, this is a great choice because it explores more details. Being set in an earlier time period, this game was originally released in June 16, 2006, and may also have versions for Mac other than for Windows. It takes place in the Macedonian empire and explores more about the feats of Alexander the Great in around 336 BC. The whole title has a total of 100 turns, with a new map, new units and some more factions to enjoy using and controlling. In Caesar in Gaul, you focus more on Caesar as it is still part of the Rome series of the title. It is a brand new historical battle in the making and the mechanics are more challenging than ever. What’s more, there is a multiplayer campaign that is not too complicated in instructions and focuses more on character development. It has a uniquely designed campaign map for you to enjoy. In this title, more regions, provinces and factions are added. There are a total of four playable factions in the title and focuses more on Gaius Julius Caesar himself. In this title, 24 turns per year is the playability for the whole title, from 58 BC up to 51 BC. Unlike other campaign modes out there, with this title, you will get series of interesting options for you to choose from and potentially change history, and you will also get the new Battle of Alesia historical battle as a bonus. There were other combat strategy entertainment series that were not so worthy to purchase because they have a lack of expansion packs and were also sold by sources that cannot be trusted so you might not know if they are fake or legit. Q: What is the Total War entertainment title series? A:The Total War entertainment title series was developed by Creative Assembly. Its main goal is to produce a playable title that will cater to those needing a way of practicing how to put strategy onto a battle scenario, as it is a strategy playable title, after all. Q: What are some of the playable titles included in the combat strategy entertainment title series? It is set in a fantasy world with a lot of dragons, vampires, dbattleves, goblins and the like. It is about the Western Roman Empire and focuses on the titular character, Attila the Hun. In this title, you can play a ton of factions, such as Roman Republic, Carthage, Macedon and various other factions. This one focuses on character leveling and is set in the era of Feudal Japan, as implied by the title itself. You can play as the titular character, Napoleon, or you can also choose the enemies of Napoleon, to see how you can change history in the making. This title focuses on the Age of Enlightenment and also has a ton of naval sea battles, the use of galleons and the like. Various medieval battles in the Middle East, Europe and North Africa can be re-lived with this unique playable title. This is an expansion pack which has 13 new playable factions, a ton of new units, maps and heroes to choose from. This is the first part of Rome II, and also involves the Greek, Egyptian and African factions. Following 350 years after the Rome series, this has a ton of new maps to explore and various factions that can now be played. It focuses during the rule of Alexander the Great around 300 B.C. and has various factions as well. The original version of Medieval II, this one has a total of 3 different playable title modes and you can choose between 12 factions in the European setting. Set in the Viking era, you can play as Leif Erikson and Edbattled the Confessor and also explore Scandinavian maps. This one is the first combat strategy entertainment title that has been published, and focuses on Feudal Japan. Acting as an expansion pack for Shogun, this one is related to the Mongol invasion in which you can choose from various new units in the roster. The graphics has also been revamped in this playable title. Q: What are the benefits of strategy playable titles? These strategy playable titles can help enhance a person’s memory and this can be helpful in your work, in your school and various aspects of life, especially for seniors who are running out of memory steam. It can help a person’s concentration if they spend time playing these strategy playable titles. It can also help a person’s problem solving skills so that they can be able to remedy some problems in life that they cannot solve easily. The strategy playable titles can also allow you to be more creative and to think better with strategies. Also, you can apply these strategy playable titles to your academics, such as in the field of math, science and computers. Q: Can video playable titles be beneficial to kids? 1. Helps with their hand and eye coordination: these video playable titles can help with hand and eye coordination through the use of the controller or keyboard. 2. They can learn facts about history and science: titles like Total War can help a child learn more about history, and certain other video playable titles can help in science. 3. Critical thinking skills are also enhanced: a child’s critical thinking skills can be enhanced due to the strategies required in the video playable titles. 4. Multiplayer playable titles can enhance teamwork: if the video playable titles are multiplayer in their modes, this allows children to have teamwork. 5. They will learn about failure and success: because there is always a winner and a loser in any title, the video playable titles can help them to learn about these concepts of life. 6. They will remember things better: a better memory can help children to enhance their memorization in their school if they play these video playable titles. 7. They can solve problems easier: with their problem solving skills tested, these video playable titles can help them think more of outside the box solutions. Q: Can battle playable titles help the military? 1. It can help them strategize their next military attack. 2. It can alleviate a soldier’s PTSD or post-traumatic stress disorder after battle. 3. It is a cost-effective training program for the military. Q: Can seniors also play combat strategy entertainment titles? Seniors with dementia and Alzheimer’s can help themselves remember things better with video playable titles. It can also help the senior to assess boredom when not doing anything. A combat strategy entertainment titles can keep them busy and thus, lead them off depression. Because combat strategy entertainment titles requires thinking skills, it exercises their brain. The combat strategy entertainment titles can also help them exercise their hand and eyes. Q: What are some strategies for combat strategy entertainment titles? 1. Always remember the formula: Swords are greater than Spears, which are greater than Cavalry Rock. 2. Know your infantry type, such as Spears, Special, Shock or Heavy, depending on their gear. 3. Assess your archers and ranged allies properly and make them shoot effectively. 4. Minimize friendly fire and make amends for the poor accuracy of artillery shots. 5. Aim for the enemy General to reduce the morale of the enemy. Q: What are some other popular turn based strategy playable titles out there? This one is space themed and is also very good in terms of graphics. If you are a fan of battle within a medieval setting then this is a playable title you should choose as well. This one is on the cyberpunk culture and is quite a break from combat strategy due to the difference in graphics. It is an old playable title as it has really bad graphics, but the playable title play is super addictive despite that. It is one of the pioneers for the turn based playable title style. Unlike historical playable titles, this one has a unique theme that focuses more on unique characters and beasts of battle. Like combat strategy, this is one of the most celebrated and sought after turn based battle playable titles you can be able to gather around in an online store or novelty shop. This one is mostly on a modern setting as compared to the fantasy and medieval types of playable titles out there. Like the other installment, this one has various improvements on how the army forces move. A predecessor to the Civ series, it focuses more on a science fiction aspect, like Galactic Civilizations, and is pretty good. This is also one of the most legendary turn based playable titles out there, and is also space themed. It has a remake by Firaxis. An indie playable title, this is a little simple and straightforbattled for the younger audience. This one focuses on an RPG style rather than just simply turn based battle, but it is still very good. If you are a fan of space themed playable titles about battle, this is a good choice for you. This one has a tabletop style playable title strategy due to the introduction of playing cards and dice, so it is unique. Q: What are the differences between the Windows, Mac OS and Linux versions of combat strategy entertainment titles? 1. Boot camped OS from Rome II is not supported on Mac OS. 2. There seems to be a lot of crashing problems in the Mac OS version. 3. The encyclopedia controls for the Mac OS version can be tricky to set. 4. The “Unlimited Video Memory” setting is not available for the Mac OS version. Q: What are playable title expansion packs? The expansion pack is one entirely new supplementary playable title that will not work without your original playable title. Think of it as a new patch. The DLC or downloadable content is usually an item, a map, a character or simple items from the playable title, but not an expansion pack. Q: Why are expansion packs important in any playable title? 1. It helps to keep the players from getting bored. 2. It explores more aspects of the playable title and its story. 3. It can be additional revenue for the playable title developers. Q: What are the benefits of video playable titles? Most video playable titles can help people who want to be surgeons someday, so that they will be able to execute their operation smoothly with accuracy and attention to detail. Many people and studies suggest that playing video playable titles can actually enhance a person’s vision. People who have dyslexia can also benefit from video playable titles just as it does improve a normal person’s vision altogether. Many people have felt more energized with their work if they take some time off to play these video playable titles. Titles like Total War can help people to learn more about their history. If you feel old due to lack of memory and brain activity then you can depend on the video playable titles to help you feel young again. This is due to the hand and eye coordination that is employed when you are playing the video playable titles. These are mood boosting and pain killing things that your body releases when you play these video playable titles, much like with sports. For multiplayer modes, you can actually learn the value of social interaction, especially for children, so that you do not feel alone too often. It can help them to have a better balance because of the mechanics of these video playable titles. There are many video playable titles out there that require some critical thinking and decision making. Because you are focused on and immersed in the video playable title, you will feel less hungry and may cut off your vices like drinking and smoking much faster. Most video playable titles are very much stress-relieving, especially because they also alleviate boredom. Because of the sense of control, those who play video playable titles are less likely going to be bullies. People who have autism can also benefit from the use of a video playable title. Q: What are the spin-off playable titles of the combat strategy entertainment title series? Q: Why did nations go to battle? 1. They want a better quality of life. 2. They want to protect their nation from threat. 3. They want to conquer other nations. 4. They want to take back a land they have lost. 5. They want other countries to respect them. Q: What are the challenges of battle strategies? Q: Why aren't there many female video playable title players? 1. Majority of strategy playable titles, console playable titles and action playable titles are for the male demographics. 2. There’s always sexism when it comes down to things like Barbie vs. Hot Wheels. 3. It is the same sexism as “women can’t do math/science/programming”. 4. The definition of “playable titler” is only limited to console playable titles and not Candy Crush and Pacman. Q: How can teachers use video playable titles like the combat strategy entertainment title for educational purposes? Q: What other popular playable titles are now being used for educational purposes? Helps children to learn algebra more effectively. Can teach children phrases and words on various languages. Helps kids make their own creative skills useful. A great must-have for programmers in the making. Alternatively spelled as Scribble Naughts, it is a playable title that enhances creativity and critical thinking skills. For your toddler that may also love watching Dora. Lets children design their own playable title levels. Aside from being a casual playable title on its own, SimCity can also help your child’s management skills. It can teach children the basics of financing. It involves critical thinking skills and is similar to the Portal video playable title series. Q: Which title in the combat strategy entertainment title has the most difficulty? A: The hardest title in the combat strategy series, according to a majority of players, would be Warhammer, due to the factions giving you harder battles. In fact, veterans of the TW series find this playable title extremely hard as compared to the previous combat strategy entertainment titles out there. Q: What were the accomplishments of Napoleon? 1. His victory in the Siege of Toulon. 2.During the Italian Campaign, he made French the victor. 3. His skills led to the victory in the Battle of 13 Vendémiaire. 4. He became the Republican government in France’s first consul. 5. Modern French education won’t be the same without him. 6. The Civil Code Napoleon has been referenced by various world leaders. 7. He was a great contender in the 3rd Coalition. 8. He simply made France badass in all of Europe back then. 9. In the Battle of Wagram, he also led with victory. 10. He regained power through escaping his Elba exile. In the long run, we think that the winner of the battle is the Medieval II Gold as the best Total War game, due to the intuitive AI settings which make the title more realistic and allowing you to easily control your army, economy and country to strategize better.